The drums were dropped from a height of 12 feet, while the blimp was held in a stationary attitude. Gassing of the airplane was completed with the help of 50 natives who had assembled to watch the excitement. On 21 November 1943, Lt. Richard J. Craig, USN, and Lt. John A. Cahill, USNR, 106 071, were dispatched from Fortaleza for a small settlement 70 miles south to assist in the rescue of survivors of a VB 145 airplane that had gone down at sea off the coast of Ceara. Natives had picked up the pilots and crew members and were reviving them with native chicken soup. 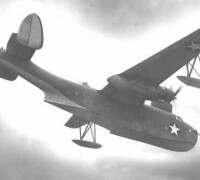 The PBY5A was landed in the open sea. The water seal was broken in the bow turret so the sea poured in. The pilots were able to make the beach however by going up a river with the wheels down. They found it feasible to wait for high tide at approximately 0100 Peter. The nose wheel had touched bottom by this time on the sloping river bed but it took some time to jockey the plane into position so the main wheels would get a solid grip and roll the aircraft onto land. Lt. Craig borrowed a native horse, once the plane was completely ashore and rode five miles to the native settlement where the survivors were located. 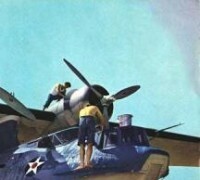 He returned with the survivor who needed medical attention more than the rest and taxied the plane up onto the beach where he took off from the strip of sand for Fortaleza.The most recent single-engine operation occurred while the squadron was preparing to leave South America and return to the United States. Lt. Gordon E Harbert, USNR, 117 045, departed Ipitanga at 0120 Peter 14 November 1944 on a ferry flight to Santa Cruz. 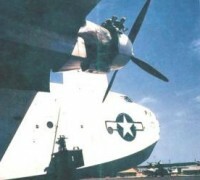 One hour out away from base, he switched fuel tanks and his port engine cut out immediately. 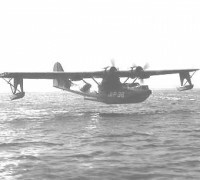 He turned back toward base but found it impossible to maintain altitude and was forced to land at sea eight miles from Bahia Bay. 1.We regret to inform you that subject cruise box is missing as of this date. Cause - marine disaster involving 94-P-9, Buno 46454. Details - At 0200 Peter, or thereabouts, at a position approximately 20 miles seaward of Ilheus, from an altitude of 8000 feet, before government property was thrown overboard, subject cruise box was jettisoned from said plane, and plummeted earthward at an estimated speed of 500 miles per hour, approximately the trajectory of the 12,000 pound "block buster". Upon contacting the Atlantic, the following articles are known to have spread over a large area: one umbrella, two bottles of Old Taylor, one gross of (censored), one photograph of the Warren High School graduating class of 1935, assorted uniforms, one dirty jock strap, one pre-war civilian suit. fifteen out-dated "C" ration gas coupons and one Esquire Club membership card. Subject cruise box subsequently resurfaced and then slowly settled, stern first, in 100 fathoms water. The swirl was marked by a Mk. 1 Mod. 1, depth charge marker and straddled by two Mk. 15 miniature bombs, (once again demonstrating the value of a concentrated training program. Two Mariners are employing Steinhardt "hold down" tactics in the vicinity of the Vaseline hair tonic slick, and will sink subject cruise box by gunfire to prevent falling into enemy hands, should it resurface. Native fishermen in Jangadas salvaged one Clark Gable type quick attachable type mustache. 2. Recommendation - that subject cruise box be stricken from the now famous list of VPB-94 cruise boxes. While the squadron was still based at Belem, in April 1944, a report was received that three Brazilians had seen an object closely resembling a periscope which proceeded down the Maracana River from Point S. Tome to the mouth of Cumara Creek against a very strong flood tide. It was trailed by a wake, as of a submerged submarine and sank beneath the surface and reappeared several times. The report also claimed that a fisherman and his son reported seeing what they thought was a searchlight playing briefly on the bank of the Maracana River at S. Tome Point. Officers of the squadron were sent to the area in a Coast Guard Cutter and made a complete investigation. Proof was found that a submarine had been in the river. However, the Squadron Commander, Lt. Comdr. Harold R. Swenson recommended to the Naval Air Facility at Belem that closer communications be established with the region so any future contacts could be investigated immediately. Since the squadron arrived in South America, it has had several different mascots, love birds, mongrel dogs (one of which was named Cerveja), an armadilla, a marmoset and a monkey. The monkey, whose name is "Joe" came from Peru. He was purchased by Lt. John D. Stapp, USNR 143 896, and resides in a specially constructed B.M.Q. (bachelor monkey quarters) in front of the squadron barracks. Lt. Comdr. Douglas Gray Parker, USN, VP-84;t.
Lt. Comdr. Paul T. Weber, USN, VS 31. Two other VP-94 officers have been made commanding officers.